Taylor survived in the near-freezing Pacific waters and gale force winds for an hour and a half before he was found by his crew and hoisted back aboard. The key factors in his survival were the seamanship of the 65ft yacht’s skipper and crew, the dry suit that kept hypothermia at bay, and—crucially—his AIS man-overboard beacon. AIS (automatic identification system) is a method of tracking vessels via GPS and sharing this info publicly over certain VHF radio channels. The VHF channels 87B and 88B are reserved for transmitting and receiving digital data. These transmissions are automatically generated and received by dedicated AIS equipment onboard every commercial ship and many recreational vessels. An onboard chartplotter, tablet or computer receives information from this AIS device. When your AIS equipment receives the data from other AIS-equipped vessels, small triangles are placed on your chartplotter screen to indicate where the other vessels are. With such information on your screen, you’ll have greater situational awareness and an increased chance of avoiding collisions. If you’re going to invest in an AIS MOB beacon, you must have an AIS transceiver or receiver installed on the vessel you are sailing on. AIS is a great safety feature for cruisers, and its usefulness has been expanded by the increasing availability of personal AIS man-overboard beacons—small devices that can be attached to a lifejacket. They receive position data via an internal GPS antenna and transmit that data on the AIS VHF channels to any vessel within range. Upon receiving the signal from your AIS MOB beacon, your AIS-enabled chartplotter (or a smartphone or tablet equipped with an AIS app) should sound an alarm and provide you with the bearing and range to your person overboard—much as the MOB button on your chartplotter does. The difference is that while the plotter’s MOB function will guide you back to the place where you pressed the MOB button, the AIS will point you toward the MOB’s actual location. Bearing in mind that the victim may have drifted a considerable distance from the point where he or she fell overboard, the benefits of a personal AIS beacon are obvious. Many sailors are already familiar with EPIRBs (emergency position indicating radio beacons). A personal locator beacon (PLB) is just a smaller version that you can carry on your person. Like a personal AIS beacon, a PLB can be clipped to a lifejacket and transmits an emergency radio signal containing your GPS position. However, a PLB transmits its emergency signal to satellites that are orbiting the earth. When a satellite receives an emergency radio signal from a PLB or EPIRB, it relays this information to a ground station, which in turn, alerts a search-and-rescue organization, like the Coast Guard. If you’ve just fallen overboard and have activated your PLB, your fate is therefore in the hands of authorities who may be hundreds, or even thousands of miles away. It may be an hour or more before your signal is picked up, and much longer before help arrives. If your shipmates are belowdecks, it may take them a while to realize that a crewmember has fallen overboard, and they certainly will not be aware of your position once you’re out of sight. An AIS beacon radically increases your chances of survival, since the vessel closest to you is the one you’ve just fallen from. I’ve recently reviewed some of the most popular devices on the market. Here are a few of the things you should look for. First, check out the transmit range. Some manufacturers have listed a transmit range of 4 miles for these beacons, while others have boasted as much as 10 miles. It’s important to remember that these are transmitting over VHF, whose range is line-of-sight. The height of the receiving antenna and the prevailing wave conditions will have a big impact on transmission range. Then there is the question of DSC (digital selective calling). DSC is a feature built into modern VHF radios that, among other things, allows for private radio calls between vessels. DSC also has a distress feature that, when activated, will trigger an alarm on the radios of all nearby DSC-equipped vessels. Some AIS MOB beacons will trigger a DSC distress call as well. That said, some of this functionality varies by region, and unless you already have one you’ll also need to acquire and enter an MMSI number. So before buying a beacon for its DSC feature, be sure to do your homework. Although AIS beacons are currently the only way for an MOB to be directly located by nearby vessels, they are not a complete solution. With worldwide coverage from satellites, PLBs offer direct alerting of rescue services, which will then initiate search-and-rescue operations. Most PLBs also transmit a signal on the 121.5 Mhz emergency aircraft radio frequency. This feature can further aid rescuers in locating the victim. 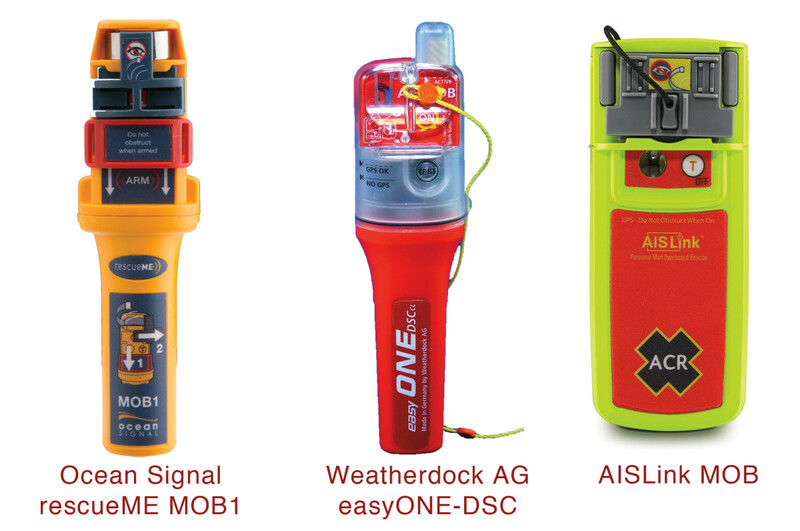 Considering that PLBs and AIS beacons work on different principles, wise offshore sailors will actually fit their lifejackets with both types of device. Ah, you ask, but why isn’t there a unit that combines the functionality of AIS beacons and PLBs? Perhaps we don’t have much longer to wait. Not yet on the market, but listed as “coming soon,” is the Seaangel SA16+. Nearly identical to the company’s AIS Eco Flare, this device will function as both an AIS beacon and a PLB. Could this two-in-one product be the first of a new generation of lifesaving personal distress beacons? The S10 stands out for its rugged simplicity, with manual activation, an integrated antenna and a waterproof rating down to 180ft. This unit is a little bulky for easy life jacket installation but can be worn on a belt. It is buoyant and when attached to a lanyard you could let it float in front of you. Raising it up by hand may, however, provide a better signal. Its battery is good for five years and will provide enough power to transmit a signal for at least 24 hours. 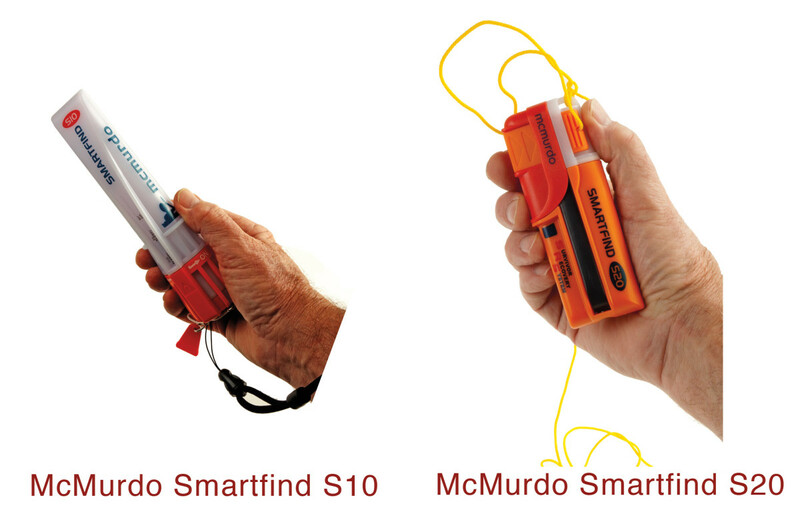 The S20 is a relatively inexpensive, compact unit designed to be fitted to a life jacket. Upon manual activation, a coiled antenna springs from the case and begins transmitting for at least 24 hours. With the unit attached to your inflated life vest tube, the antenna will stand vertically for proper transmission. The battery has a storage life of seven years. This is the only unit that is automatically activated when immersed in water. When a soluble tablet dissolves, it forcefully deploys the coiled antenna. Once activated, the unit is designed to float in front of you while remaining attached via a lanyard. It has a seven-year battery and boasts 36-plus hours of transmit time. Small but mighty, ACR’s AISLink is an automatically (or manually) activated beacon with a spring antenna, a built-in strobe and a seven-year battery. It can be easily attached to your life jacket, will transmit for a minimum of 24 hours and is waterproof up to 33ft. This small unit from Austrian company Seaangel has an integrated antenna and is automatically activated by the inflation of a lifejacket. 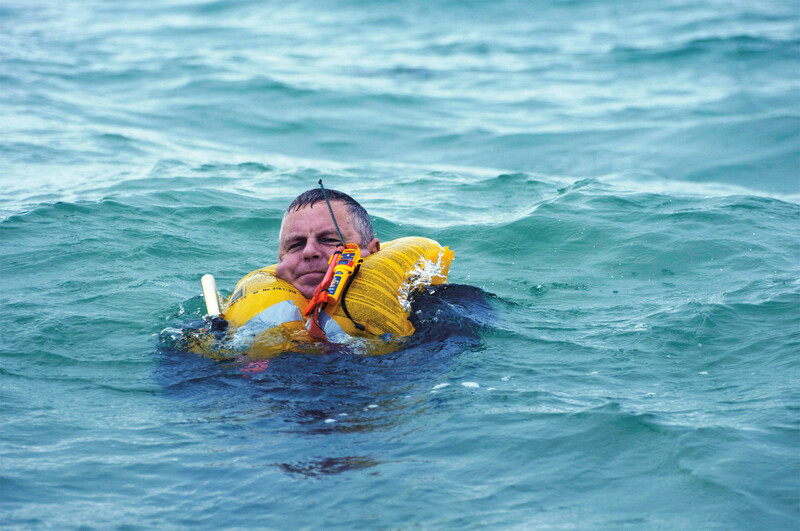 Once activated, the unit is designed to be clipped to a small strap (included) that affixes it to your life jacket in such a way that it is positioned with its antenna pointing up. It’s equipped with a five-year battery and boasts astonishing 72-plus hours of transmit time. 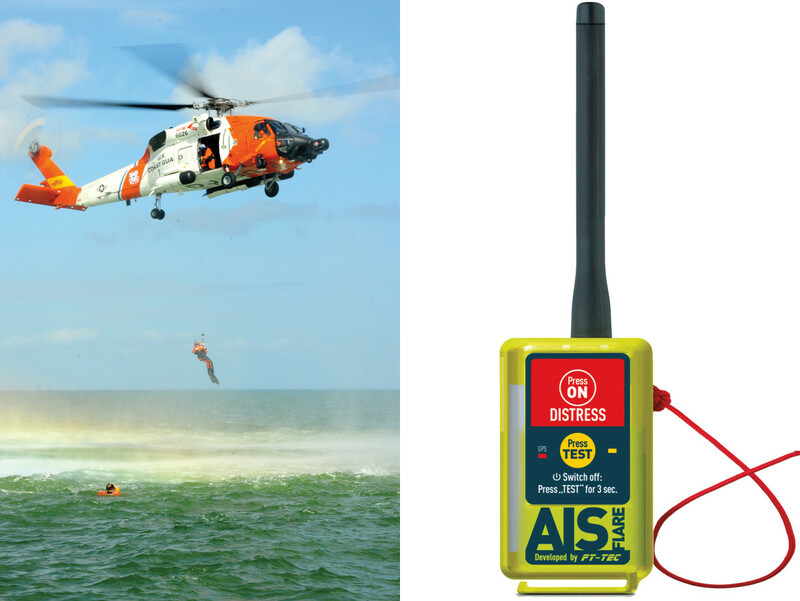 There exists another form of AIS beacon called an AIS search-and-rescue transponder (SART). These are intended to be activated when abandoning ship and are usually used to help locate survivors in a liferaft. Traditionally these devices were called Radar SARTS, and they would transmit a pulse that would then be displayed on the radar screen of a passing ship. AIS SARTS, however, operate on the same principle as an AIS MOB beacon by transmitting your GPS position on the AIS frequencies. They are a larger and heavier than personal AIS MOB beacons, but have increased battery capacity and transmit times exceeding 96 hours. Phillip Gutowski, a regular contributor to SAIL, owns a Tayana Vancouver 42 and runs BoatRX (boatrx.com), a marine systems installation business.